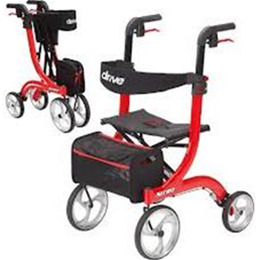 Made of durable aluminum, this lightweight 4 wheel rollator from Drive Medical features an attractive, European style design that’s sure to impress. The handles on this 4 wheel rollator are height adjustable and have an ergonomic design for more comfort with less wrist strain. This Drive rollator has 10” front wheels that make it easy to traverse over most obstacles found both inside and outside. Also, the rollator features a cross-brace design that allows for both side-to-side folding and added stability. The backrest is flexible for more comfort, and it is also removable. For more ease of use, the Nitro Rollator can be folded using only one hand due to the handle on the mesh seat. The Nitro Rollator comes with a front side removable carry pouch to help you take your belongings with you. The Nitro uses bicycle style brakes, and for added safety, the brake cable is inside the frame so it won’t get caught on things. Limited lifetime warranty.